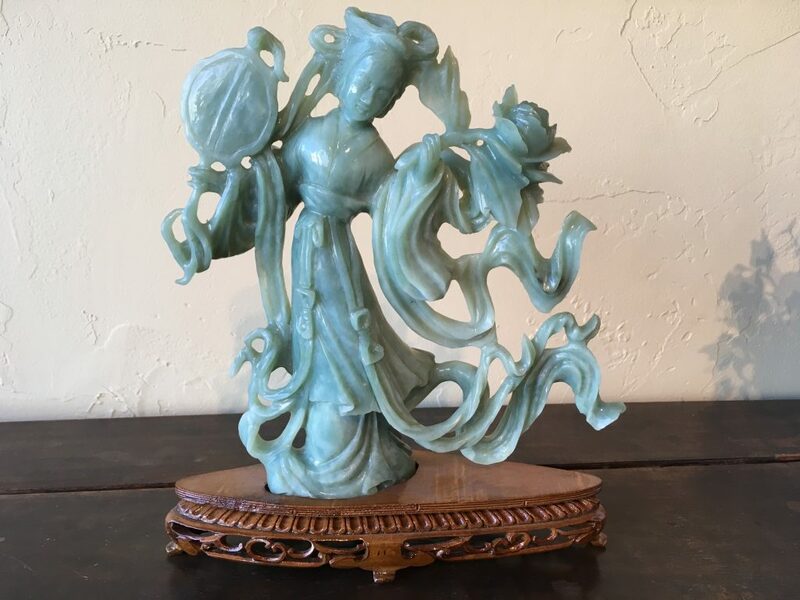 This flecked sea-green jade dancing figure is dressed in a flowing robe draped at the waist with scarves, bows and billowing ribbons. Her hair is drawn up in a topknot. She stands swaying, with a dreamy expression on her face. Her right hand holds a fan and her left a sprig of peony flower. She stands on a finely carved oval, tiered wood stand. Below the top tier she stands on is relief carving of a frieze of stylized petals. Below this is a tier of openwork carving of trailing vine with stylized a frieze of lotus petal motif which then billows into an attractive apron with openwork carving of trailing vine between four ruyi-shape short cabriole legs. This jade figurine was important enough to came out of China with some refugees in mid 1900s.